I wanted to do something a little different for this post. I wanted a theme, a story. 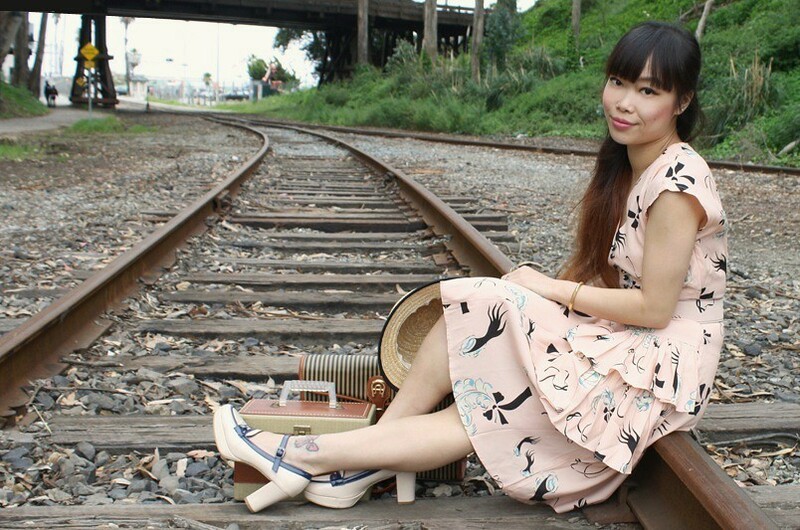 Traveling in style with vintage train case and carry on in a 40s inspired dress by the railroad tracks. I love this gorgeous Sadie Ruffle Dress in the Slap and Tickle print gifted by Trashy Diva. If you haven't heard of Trashy Diva, you are missing out! They create amazing vintage inspired clothing in all kinds of cuts with many different patterns and fabrics. The Slap and Tickle print is my favorite, I adore its soft pink color and the ribbons, feathers, and swirly hands. It even comes with a matching belt! This dress makes me feel like a doll. Sadie Ruffle Dress c/o Trashy Diva. Vintage two tone leather train case from Etsy. Thrifted vintage stripes carry on bag by Aigner Etienne. Straw boater hat from Hong Kong. Patent leather oxford heels from Hong Kong. Your outfit is so cute! I love the vintage theme. Great pictures too! These photos are amazing. You are so beautiful. I want to steal your shoes. youre perfect and so is the dress/shoes! ah! wow! Thank you Ashley! I am so thrilled to see you commenting on my blog cuz I absolutely adore your style!